Subscribe: RSS | Email	Are you bright enough to shine despite... The Darkness? 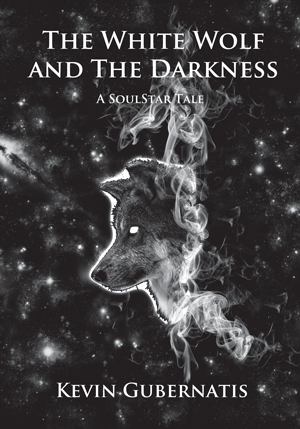 The White Wolf and The Darkness is available in print and for all e-readers. Click any button below to order your copy! When he's not writing the next book set in the Soul Star Galaxy, Kevin is playing and reviewing video games, having an existential aside about heroism and villainy, wandering about the internet in search of illustrative imagery, or just sitting back and eating a delicious meal prepared by his amazing wife. Thoughts about all this, lore, and more, found here on the blog. A new Spooky story for the Halloween season! Not. One. Drop. Read the conclusion to the story, The Blood of the Honored. Copyright 2013-2014 Kevin Gubernatis. All Rights Reserved.